The photos below are from C. Brewer Annual Reports 1946-1951. Most were taken at Hakalau Plantation. They are from a period when the plantations were working at transitioning from "manual" to "mechanical" harvesting and cultivation. Hakalau had a particularly difficult time making this change mainly because of an inadequate road system. Factors that impeded the development of such a system are discussed in a road study done for Hakalau in 1953. They included diverse land ownership, rugged topography, the lack of a good cinder source for road construction and a very high proportion of private planter operations. These 2 camps, Upper and Lower, were the largest by far with a total of about 150 dwellings. This is where most of the main community buildings were (such as the theater, the store and the gym), and where many of the supervisors lived, including the manager. They were close to the Hakalau mill, which was in the gulch below, and to a number of buildings related to sugar production (warehouses, offices, etc, mostly located between Lower Camp and the mill). Also called “Up Camp” it included the manager’s home and houses for most of the supervisors. Other buildings to support the entire plantation community included a gym, a theater, a pool hall, a social clubhouse, two Buddhist churches, a Christian chapel, a Jodo Mission, personnel office, Japanese language school and Aikido Hall, a poolhall or Filipino Club House. There were 2 camps within about a mile of the Hakalau Camps, heading in a Hilo direction on the old Mamalahoa Highway. The dwellings were built while Wailea Plantation still existed (Hakalau acquired it in 1943.) About 45 dwellings, total. Wailea Town was between them. 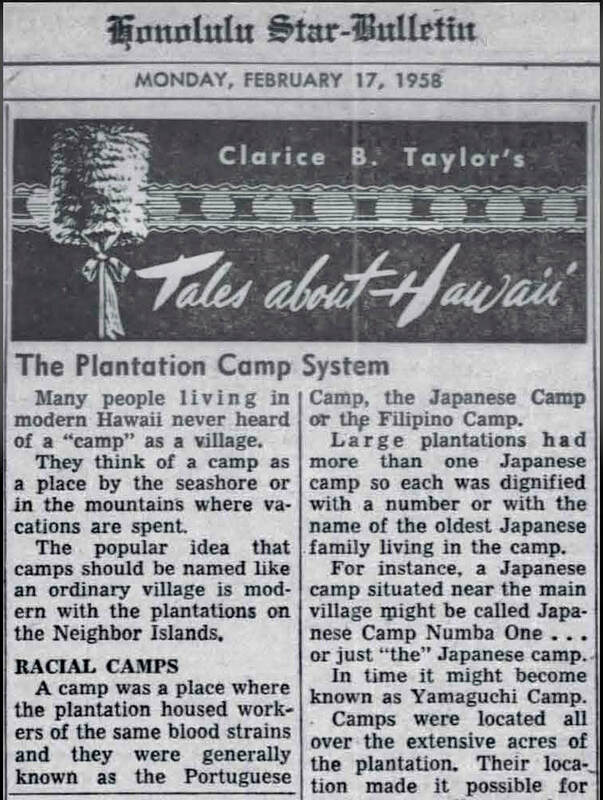 Wailea Town was beside this camp on land not owned by the plantation, but the people it served were from the plantation. There were 2 Chin Chuck camps about 2 miles mauka of Hakalau Upper and Lower Camps. About 45 dwellings, total. Camp size: About 20 dwellings (mostly still occupied in this period), a clubhouse and a poolhall. Camp size: About 25 dwellings and a clubhouse. About half of these dwellings were vacant by the early 1960s. There were 3 camps. Korean and Sugimoto Camps were close together and could be accessed from a road going mauka off Mamalahoa Hwy just past Hakalau gulch as you go up the coast. They were a mile up at about 300 feet elevation. Mauka Camp was 2 miles further up at about 1200 feet. About 35 dwellings, total. They were vacant by the early 1950s. Camp size: About 5 plantation-owned dwellings and another 10 privately owned dwellings. Mauka Camp also included a Scout camp that served all Hakalau kids, and a community clubhouse. All of the plantation-owned dwellings were vacant by the early 1960s. Location: Both camps were located between the Kamaee and Honohina Camps, about ½ and 1 mile mauka of Mamalahoa Hwy, at about 600 and 900 elevation, beside Awapuhi Gulch. Camp size: Pake had about 6 dwellings and a community hall. Kaminaka had about 4 dwellings (no dwelling photos are available.) It appears that all dwellings were vacant by the early 1960s. These were 3-4 miles up the coast from the Hakalau Camps and the mill. About 80 dwellings, total. Location: Located about 3 miles up the coast from the Hakalau Camps and the mill, it was directly mauka of Mamalahoa Hwy. Camp size: About 35 dwellings, a store, a pool hall, and a garage. Camp size: Eight dwellings in Honohina Mauka, five of which were vacant by this time. Ten dwellings in Nanue -all vacant by the early 1960s. These were 4-5 miles up the coast from the Hakalau Camps, ending at the northern-most part of Hakalau Plantation land. About 35 dwellings. It appears that about half of these dwellings were vacant by the early 1960s. Location: Located in Ninole about 5 miles up the coast from the Hakalau Camps. It was on both sides of Mamalahoa Hwy.